Discover Deira, one of the most desired business and shopping districts of old Dubai. 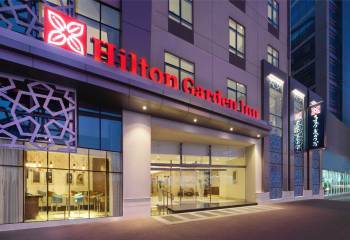 Located on Abu Baker Al Siddique Road, Hilton Garden Inn Dubai Al Muraqabat offers a contemporary base in the heart of this lively city, with easy access to Downtown Dubai and Dubai Creek. Major business hubs and Dubai International Airport are merely 10 minutes away. Shop till you drop at the legendary Dubai Mall or visit Burj Khalifah, the tallest building in the world.Rest and relax in our stylish guest rooms, or upgrade to a suite for even more space. Each suite offers separate sleeping and living areas, as well as two HDTV’s and our innovative Serta Perfect Sleeper beds. Complimentary WiFi is available throughout the hotel and we have extensive meeting space for a range of special events.Enjoy delicious local and international cuisine at our Garden Grille & Bar or order a meal from room service for the ultimate convenience. Our contemporary Dubai hotel also offers a rooftop swimming pool with views of Deira and a spacious 24-hour fitness center. Host your next corporate event or social function at this Dubai hotel and choose from a range of extensive meeting spaces. We offer professional boardrooms and bigger spaces which can be combined to accommodate large groups and weddings.